Well when i heard of this album and then seeing the cover with Eric driving and BB in the back I was sold I knew it was going to be good and I was right the opening song riding with the king fit the cover perfectly and the respect that Eric was giving BB then you see the older pic of the 2 of them jamming together back in the cream days (check out Eric's doo?) that was a great album a combination like that can't be duplicated unless you were Stevie Ray Vaughan with Albert King. This album is an amazing fusion of Blues and Rock in which 2 legends come together to produce something legendary. This is a great CD. It really puts blues and rock together and it sounds great. My favorite is probably key to the highway. 2nd is probably Riding With The King. I would recommend this to anyone who likes either blues or rock. As I am but a 17 year old kid. I have been listening to Eric Clapton and B.B. King since I was 12 and have also been playing all of their music for many years now. I found all the songs to be the best work that B.B. King and E.C. have ever done. There is a mix of all styles of blues and that's what makes it the very best CD in my collection. If a 17 year old kid is impressed by a CD like this...then anyone could be! 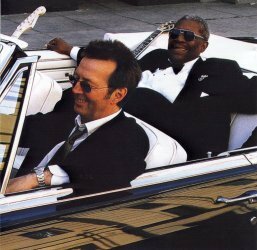 I don't think, being a guitarist of twenty years myself, that Clapton's playing on this album is as good as it could be. On the rock tracks - Marry You for example - he's not that impressive. But the highlight for me was hearing BB play acoustic guitar. Also Clapton's solo on Worried Life Blues is a a peach. The album as a whole is worth is a curious mix of textbook blues and rock. It's good, but I wish they'd done this in the late 60's when both men were at the top of their playing. The King and Slowhand play together once again. They always sound great together. This is of course not the first time they played together, they've known each other since BB worked with Eric back in the Cream days. I guess they've played here and their over the years. Most recently, they played together on the Tribute to Stevie Ray Vaughan Album, and I think Stevie Ray jammed with both of them at one time. They also played together in "Blues Brothers 2000," along with Billy Preston who at this time is Eric's keyboard player on tour. And now Eric and BB have created an album together. The album really is cooking. It starts out with "Riding With the King," which when I first put it on, I grabbed my guitar and played with them. It's up tempo and fun. There are some other up tempo songs like "Days of Old," and "Hold On I'm Coming," which really rocks. The interplay between Eric and BB on that song is truly a classic moment in blues history. The other two, "I Wanna Be," and "Marry You," are my favourites, written by Doyle Bramhall the 2nd who opened for Eric in his 2001 tour, (Bramhall the 2nd is son of Doyle Bramhall Snr. who co-wrote songs with Stevie Ray Vaughan.) "Marry You" is fun! I love Eric's wah work on the song, it brings me back to the cream days, I haven't really heard play wah since Derek and the Dominos. And Speaking of Derek and the Dominos, Eric redoes an acoustic version of "Key to the Highway." It's not quite the same as the Dominos version, and the interplay between BB and Eric is not the same as the interplay between him and Duane Allman on the electric version, but it still works. There's also an acoustic version of "Worried Life Blues" and the electric "Come Rain, Come Shine" which makes an excellent closure to the album. This is one of the classic blues albums of all time. It teams EC with BB for the first time. The song "Key To The Highway" has always been one of my favourites. It has new life the way he plays it acoustically. I saw him do it live in Oakland and it was the highlight of the night, along with his version of the Wizard of Oz song "Somewhere over the Rainbow". Worried Life blues is also acoustic and again a favourite. Come rain or shine a remake of the Sinatra classic is another favourite. The Sam & Dave classic is another song that will get your attention. A nice ambience on most of the tracks, with an amusing retro 'sixties' feel to some of the mixes. When do you hear different vocals coming at you out of separate channels like that, these days? I really like EC when he's playing in laid back mode. 'Key to the Highway' is a real standout performance, as far as I am concerned, and it is good to contrast this performance with the great jam with Duane Allman on the 'Layla' album. I can do without the attempted 'funky' workouts on the other hand. Stick to the knitting, you guys. However, this is great album for listening to whilst staring out of the window (as my companion says). While I myself was waiting for this compilation of artists, I was felt let down when the album sort of went down hill after the first track. I was hoping for a majority of up beat rock songs like the first track, but when the rest were slower I got kinda bored. "Riding With The King" is one of the best albums of the year. It is a very enjoyable collection. This album represents two artists at the top of their form. I don't know about you, but I've been waiting for this album for years! It doesn't disappoint either. The guitar playing is killer. Its an instant classic. Eric and BB picked some great songs to sing as well. Welcome to the B.B. King and Eric Clapton playground featuring a celebration of blues at its most sophisticated. This album undoubtedly captures the message and temperament of native blues and is a testament to the mutual admiration and efficacy of both artists. The sleeve notes to 'Riding With The King' reveal the depth of B.B. 's joy at fulfilling a lifelong dream through this project, which represents an equal realisation for the music industry and fans alike. Given a choice to select from B.B. 's entire back catalogue, Eric defined the material, whilst Simon Climie co-produced another polished album complete with his trademark abilities providing sound resonance and a shrewd grasp of modern technology. There are refreshing re-interpretations of blues standards including, 'Worried Life Blues' and 'Key to the Highway', with both musicians maintaining their essential qualities; B.B. 's acoustic provides a real ice-cream treat. With contributions from the likes of Andy Fairweather Low, Doyle Bramhall and Jimmie Vaughan, expectations for the recording sessions must have been elevated. The music is thoughtful, captivating and sensitive. Perhaps the only absent ingredient is a departure from that certain edge of arresting spiritual turmoil and intensity which we associate with the traditional deprived itinerant blues man. The guitar work on Robben Ford's classic 'Help the Poor' is a little understated, yet there are plenty of great 'conversational' exchanges throughout the album. These archetypal journeymen have truly rested their personal demons. An up-beat album with a sense of humour; touches of satire in the lyrics of 'Hold On I'm Coming', and a few tongue in cheek moments of misogyny which we love to endear on the title track, '100 dollars for a cupid doll, no pretty chic is gonna make me crawl'.. An authentic blues educational experience from two such mature aficionados. A project which proves that the expression of blues can arise from a place of internal satisfaction. Riding with the King is an amazing collaboration between the two biggest blues men of all time. Eric also brings a more modern R'n'B feel to some of the tracks, his guitar playing, as always is perfect. BB is the personification of the blues, his voice and the rich tone of his Gibson knock me out every time i listen to this fantastic album. There isn't a wasted song, acoustic or electric, EC and BB have brought the blues strongly into the new millennium. It is a millennium anthology! Two similar musical genders in a deep guitar dialogue (check "help the poor" <my favorite> and "key to the highway" solos) You know what I mean, one guitar speaks and the other answers... simply beautiful. Once again Clapton and King show that age don't matter when it comes to making hits. This is right up there with Layla, although not the freshness of the material that was on Layla. Still the production is masterful, the vocals powerful and the guitar playing is some of the best that Clapton or King has done in quite a few years. The songs were fantastic although some have been reworked a few times. This is one that you will listen to over and over without tiring of. Beautiful songs and music. If you don't have it, buy it, it is fantastic! An unbelievable opportunity to hear two of the finest blues men off all time get it on in the studio. Some classic B.B standards such as 'Three O'clock blues' and wonderful unplugged blues with Key to the Highway and Worried Life Blues. Clapton proves again his vocal maturity and wide ranging talents with a guitar and in the production room. A rare chance to hear B.B play acoustic and he does not disappoint. It's #1 for me. Help The Poor is my favorite because EC and BB are just awesome playing together. My 2nd favorite is Riding With The King. Thanks for your hard work in producing a super website!! !